LEVC (formerly the London Taxi Company) has unveiled its range-extended electric van, which launches in 2019 and will bring a number of eco and cost-saving benefits to operators. Using petrol range-extender technology also seen in the firm’s TX taxi that launched last year, the new van will not be targeted as a ‘last-mile delivery’ solution but according to the firm, “will provide the link between out-of-town distribution centres and city destinations”. LEVC – which is owned by Geely and has seen a £325m investment in the last three years – said it’s no stranger to the van market and has been building urban commercial vehicles for almost 70 years. Prior to TX1, its taxi platforms were used to build vans too. It was only under the last ownership that it became focused on taxis. Explaining the decision to re-explore the van segment, LEVC said that transport is changing and personal vehicle ownership is in decline, while services are on the rise, driving demand for more vans and taxis on the road.” It also pointed to the Government’s zero-emission vehicle targets. The new van will draw upon the range-extender set-up in the TX, which uses a 1.5-litre petrol engine as a range extender alongside a battery and electric powertrain. This gives the TX an electric range of 80 miles, and a combined range of 400 miles with its small petrol generator. 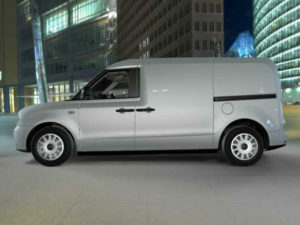 Figures have not been released for the van but LEVC said it would offer a competitive TCO. The firm also said it’s focusing on offering class-leading safety as standard, including latest active safety systems from some of the world’s leading technology providers, as well as an emphasis on driver comfort and ergonomics. The van will be built in LEVC’s new factory in Coventry – built as part of the Geely investment – next year, with customer handovers towards the end of 2019.